Even today the wheat fields of the Wimmera shimmer under a crystalline Australian sky. At midday in summer, there is an overwhelming sense of somnambulism as sheep cluster around scrappy patches of shade, distant tractors trundle past, and cockatoos wheel through the air, their harsh cries shredding the silence. 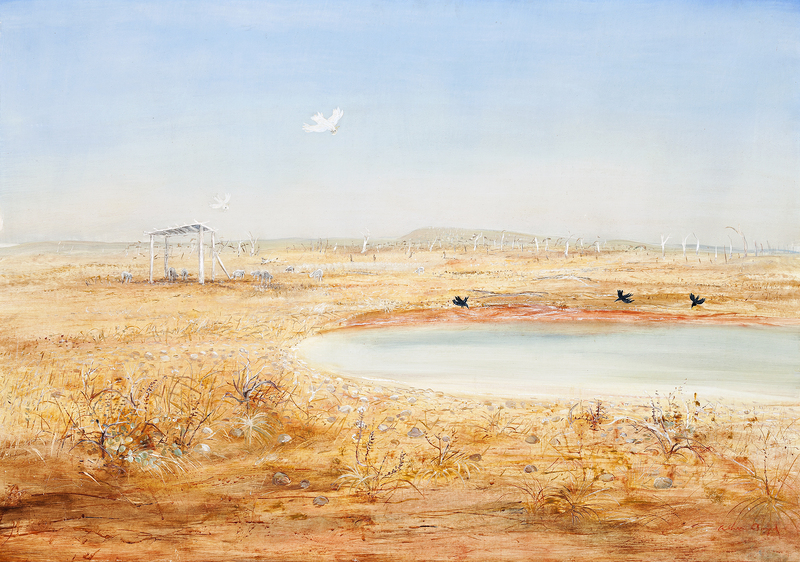 In Arthur Boyd’s meticulously recorded Wimmera Landscape with Cockatoos, c.1965 the artist captures the very essence of the scene and reminds us of his absolute mastery of landscape painting. By the mid-1960s, when this image was painted, Boyd was firmly established in London as an artist of note. Since arriving with his family in late 1959, he had held an acclaimed solo exhibition at the prestigious Zwemmer Gallery and been the subject of an extensive retrospective at the Whitechapel Gallery. Every Australian state gallery held examples of his work, private collectors included royalty and celebrities, and he had also successfully extended his talents into theatre and ballet. Utilising the translucent tempera and glaze technique he had mastered in the original Wimmera series, Wimmera Landscape with Cockatoos has its surface punctuated further by expressive marks of low impasto as if Boyd is emphasising particular points in the landscape, re-animating his memory of place. Note the fidelity of the spiky grasses and thistles in the foreground, the whitened trunks of ring-barked trees and beyond, the low rise of the Grampian hills. It is a truly palpable rendition of the artist’s beloved homeland. As if to accentuate its force of personal connection, Energy Australia, who previously owned the painting, clearly determined its destination for display, namely their Chairman’s own office where it would have marked a clear statement of intent as to that company’s respect for rural Australia.3 Wimmera Landscape with Cockatoos is a fascinating, stilled point in time, a mesmerising image by an Australian icon at the height of his painterly powers. 1. Nolan also painted scenes of the Wimmera whilst based there with the army between 1942 and 1944. 3. The text ‘Chairman’s Office’ is inscribed in chalk verso.